To cook, preheat the oven to 550 degrees. Cover the roast and cook for 15 minutes to seal in the juices and flavor. Reduce cooking temperature to 350 degrees and cook the roast about 25 to 30 minutes a pound. Remove the cover for the last 15 minutes. Use a meat thermometer to test the roast for how you prefer to serve it. Rare is 120-130 degrees on a meat thermometer; medium-rare is 130-140 degrees. To cook, preheat the oven to 450 degrees. Meanwhile, heat a large, deep pan over medium-high heat on the stovetop. Lightly coat with olive oil and sear the lamb on all sides. Remove and place in roasting pan and cook in the oven for eight to 12 minutes, or until slightly less than the desired degree of doneness. To cook a crown roast, place an empty, clean can with paper removed in the middle of the roast. The can acts as a "chimney" and helps preserve the shape of the roast. Preheat oven to 325 degrees. Place roast in the center of a roasting tray or roasting rack. 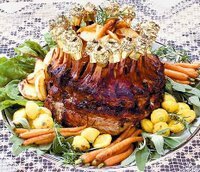 Roast pork about 1 1/4 to 1 3/4 hours, or until pork has reached an internal temperature of 160 degrees on a meat thermometer. For each of these, you want to allow the meat to "rest" before cutting and serving. You'll also see that we have a new look here...hope you enjoy it!